College expenses range from tuition to housing to bus passes. See how all these costs add up to a college's "sticker price." In its most recent survey of college pricing, the College Board reports that a "moderate" college budget for an in-state public college for the 2015–2016 academic year averaged $24, 061. A moderate budget at a private college averaged $47, 831. But what goes into these costs? 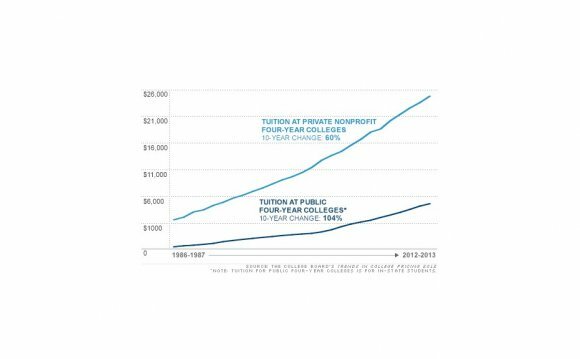 Tuition can vary by major. Students in the sciences, engineering, computing, premed programs, and the fine arts often pay more. For example, at University of Illinois Urbana-Champaign, students enrolled in the College of Engineering paid up to $2, 100 more in tuition in 2015–2016 than students pursuing other majors. Colleges often report a combined tuition and fees figure. According to the College Board, the average cost of tuition and fees for the 2015–2016 school year was $32, 405 at private colleges, $9, 410 for state residents at public colleges, and $23, 893 for out-of-state residents attending public universities. The cost of "room and board" depends on the campus housing and food plans you choose. The College Board reports that the average cost of room and board in 2015–2016 ranged from $10, 138 at four-year public schools to $11, 516 at private schools. Colleges also provide room and board estimates for living off campus based on typical student costs. Most colleges estimate the average costs for required learning materials. Some colleges even include the cost of a computer and computer accessories. The College Board reports the average cost for books and supplies for the 2015–2016 school year was $1, 298 at public colleges and $1, 249 at private colleges. Colleges may estimate some expenses they don't bill you for. These include local transportation, clothing, personal items, entertainment, etc. The College Board reports that expenses in this category for 2015–2016 ran from $2, 661 at private colleges to $3, 215 at public universities.